The Land of Nod never ceases to amaze me. I love everything about them. The design of the products, the design of their website, the unbelievable brand that they have developed...I could go on and on. The best thing about Nod is their writing style. From the names of their products, to the copy in the catalogs and site, it is pure perfection and FUN! The most recent thing I noticed was a cool feature on their site. 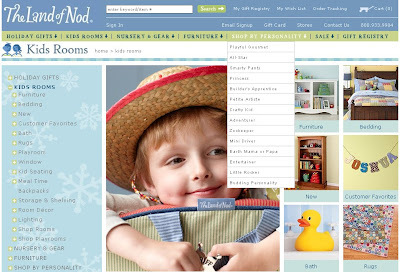 It is a clever take on intuitive navigation and site structure...the ability to "Shop by Personality." It's so fitting coming from a place that is bubbling over with personality! Love it. Nice touch!